The JEDEC Solid State Technology Association has published the specifications for the next generation of synchronous DDR memory, which promises to double the speed of DDR3 while requiring less power to operate. The publication of the JEDEC DDR4 standard represents the culmination of years of dedicated effort by memory device, system, component and module producers worldwide,” said Joe Macri, Chairman of JEDEC’s JC-42.3 Subcommittee for DRAM Memories in a statement. The new standard will enable next generation systems to achieve greater performance, significantly increased packaging density and improved reliability, with lower power consumption,” Macri said. DDR4 will come in ranges from 2Gb to 16Gb for x4, x8, and x16 modules and will have a maximum speed of 3.2 giga transfers per second, although JETEC said that further speed increases are likely as the specification develops. It will also operate with a smaller power envelope than DDR3 – 1.2v as opposed to 1.5v used in DDR3. Although Samsung and others have already started producing some test DDR4 modules, publication of the final spec will allow production to be ramped up. According to analyst house iSuppli. 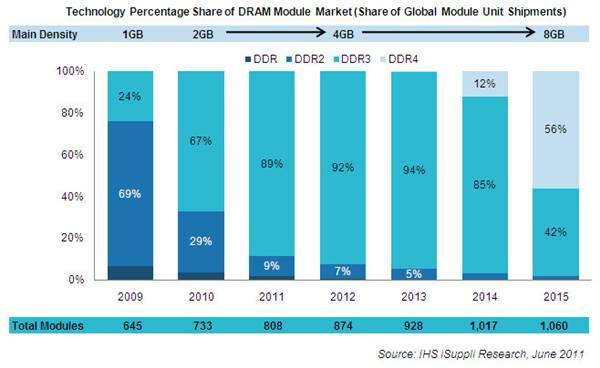 DR4 won’t have much of an effect on the market until 2014, but should account for half of all DRAM sold by the following year.